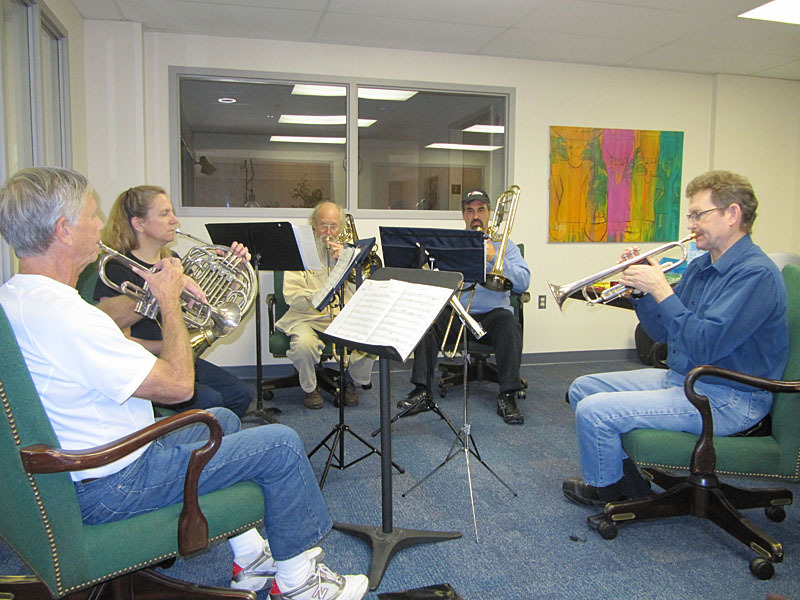 Led by Robert Posten (the guy with the beard, above, playing the bass trombone), this group has performed under many “names” over the years — Boar’s Head Brass (2007), Belsnickel Brass (2006), Royall Noyse Brass (2004), Trombadori i Firenze (2009), Puddletown Brass (2010), and more — I wonder what their name will be this year??? 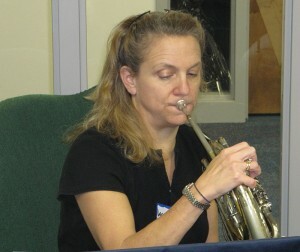 Other members of the group are Robert Birch (trumpet), David Cran (trumpet), Sharon Tiebert Maddox (french horn), and Ben Fritz (trombone). Prior to their yearly gig with The Christmas Revels, these musicians were known as the Annapolis Brass Quintet (at least, most of them). America’s first full-time performing brass ensemble, this group spent twenty-two years (from 1971 to 1993) playing in all fifty states and throughout Europe, the Orient, the Middle East, Central America and Canada. Learn more about them at http://www.annapolisbrass.com/ (and you can even see some great photos of the group). Yes, Don Spinelli will be featured soon. He is the sixth member of the brass quintet (so, I guess is kind of like the sixth wheel?). He plays timpani, drums, tambourine, and many, many sound effects. This year, expect to see him on stage much more than usual… so much of our music this year needs percussion! Thanks for commenting. So, if you have seen (or performed in) a Christmas Revels before, what is your favorite Brass or Don Spinelli moment? Favorite Brass-Spinelli? A lot to choose from, but the one that jumps out at me was the underscoring from Vainamoiren retrieving the sun in 2005 Northlands. Favorite Brass ensemble piece? Hands down, “Old Joe Clark” from 2006 Early American. Go trumpets! You always got me revved up for the show with that opener! Betsy, thanks for this Brass history! I had no idea the ensemble had been around for so long and had such an illustrious past. I always knew we were lucky to have them, but — wow!